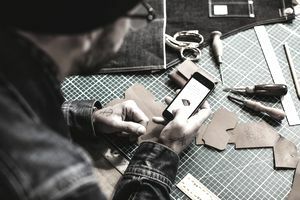 Though less and less common these days, a common question that traditional "brick and mortar" business owners ask is: Why should I take my traditional company online? First of all, let's clarify something. In the sense of this article a “traditional company” is one with a physical location and sells either in person, by phone, or mail; essentially a traditional "bricks-and-mortar" business. They may or may not have walk-in customers. Essentially, a business that is not selling physical products exclusively online, like an e-commerce company. While in many cases, the steps for setting up an online presence for a bricks and mortar business are very similar to those if you wanted to start an online business, there are some things that make an online presence for a bricks and mortar business unique. This alone should be enough reason to start a new website and begin selling online. It's an extremely important factor considering that without a website, blog, or online presence prospective clients could begin to wonder how serious you are about business. Today, companies of all sizes and industries are establishing a successful online presence. If you don't have an online presence (and a professional one to boot) then you can't expect your prospects to take you seriously and you will lose business to competitors that do have an effective online presence. While some fast food restaurants, grocery stores, and gas stations manage 24-hour service, it is impossible for most businesses. That is, without the internet. A key benefit to having an e-commerce website, is that your clients and prospects can read about your products and place orders at anytime— day or night. On regular business days or holidays. Imagine what being open 3-4 times longer could do for your business. Even if you have a traditional offline services type business you can generate leads and inquiries while you are closed and followup with those prospects and customers once you open the next day. With an online presence you can give them just the information that they are looking for, and just when they are looking for it. This means less phone calls with technical questions and more sales. Email marketing is one of the most effective ways to develop a relationship and increase sales. Starting out online means very low startup costs. You have no buildings to construct, no vehicles to buy and few (if any) staff to hire. Simply build your site and start selling. If you are already selling offline then the transition can be very smooth. You continue selling the same products that you know and have a good supply of. Putting your company online simply gives you a new source of customers. The reality is you can outsource a lot of the technical stuff and even things such as social media marketing. While you could spend tens of thousands of dollars developing the best website and e-commerce solution many of your competitors will be doing it on a shoestring. A good website can be designed simply and for very little money. Using a free platform like a self-hosted WordPress blog and a professional quality premium theme ($70 - $200) you can build a professional site by yourself. Some web hosting companies offer free site building tools. With a good WordPress theme, it is possible for you to design your own site and do it with (almost) no coding. To get started on a shoestring budget, expect to pay anywhere from a few hundred dollars to a few thousand. The basic expenses include web hosting, WordPress theme, domain name, and email marketing autoresponder service. Once its all set up it can run on virtual autopilot. The beauty of the internet is that your prospective client(s) can literally be just one click away from your online store. Through the internet you can now educate, instruct and solve clients problems. You can accept orders and payments and receive them directly to your inbox. You'll wan to learn about new effective and inexpensive ways to drive traffic to your website; the more people who find you online the more leads and sales you'll make. Are the long cold winters starting to get you down? Are you tired of the constant heat and humidity where you live? Taking your business online gives you the ability to have location freedom so you can live and work from anywhere you want; you're not stuck to a physical location. As long as you have a solid internet connection you can live virtually anywhere while you conduct your online business. Many people live in one continent, have their hosting on another and their warehouse on yet another. The world has gotten very small and you can take advantage of this. You could even move to the Caribbean or South America, enjoying a low cost of living, while doing business online. With few exceptions the internet reduces your need to “be” somewhere. Live where you want to, and let your business adapt to your lifestyle instead of the other way around. There are some notable exceptions, like landscapers, surgeons and home painters who must be in a specific location to perform their work. Of course, as appealing as this all sounds, having an online business is not for everyone. There are many reasons you should not start an online business and keep your day job or traditional business. Just one single task can make a significant difference in cost savings. For example, receiving orders online reduces the need for customer service staff. With comprehensive sales and product information online, you’ll simply receive purchase orders and payments via email or into your database. Staff numbers can be reduced, thus office space and related office expenses. A really good sales video, sales letter, or online webinar presentation can replace a full-time sales person. Making use of various online service providers you can now take all aspects of your business online, such as purchasing, billing, order fulfillment and shipping. Other functions can include pre-emptive customer service—such as answering client questions via a FAQ section or a customer forum. With your brick and mortar business, you are limited to the amount of individuals who can visit you at any given time, let alone find you. With a good website, you can literally have thousands, even tens of thousands (even millions) of people visiting your online store at once. Imagine the potential for your company, if you could expose your products and services to a potentially unlimited number of interested people. Being able to have thousands of visitors and actually having them are two different things. The success of an online business depends on the same thing as any off-line business: marketing. Learn how to increase blog traffic. Content marketing is a great way to increase traffic to your site / online store. Social media can be a powerful and inexpensive (free) way to drive qualified prospects to your site. I'd be remiss is I didn't mention that mastering the art of copywriting is one of the most valuable skills you can learn to increase sales. The internet allows you to deliver your proposal, purchase order, order confirmation quickly—in many cases instantly—to your clients. Online stores will process orders and confirm them to the client. In the olden days, purchase orders were called in, mailed or dropped off. Depending on the workload of the sales staff, it could have taken hours, or even days to process the order. With a competent online store application, you can automatically track inventory, sales numbers, outstanding orders - everything. Faster response time means happier clients and less administrative work for you. These are some of the most powerful reasons you should take your offline business online. With all the benefits of having an online business many people are selling their traditional businesses and launching online businesses for the time, location, and financial freedom it offers. Note: This article has been edited / updated by Online Business Expert Brian T. Edmondson.